Cranbourne pro triathlete Levi Maxwell admits it’s a monkey off his back after a stunning result at the iconic Challenge Shepparton recently. The significance of taking out his first professional title at the 11 November race after overcoming plenty of self-doubt and setbacks can’t be understated. To Maxwell, it reinforces why he’s devoted his life to one of the most gruelling sports on the planet. “It was a big learning experience – I’ve been a pro for nearly two and a half years now, and I had a lot of success as an age grouper, but I had all this confidence going in. I’ve had some unlucky things go against me, and some dry results, so doubt does start to creep in and you start to get injuries,” he told Star News Group. In the half-distance race comprising of a 1.9km swim, 90km bike ride and 21.1km run on Remembrance Day, Maxwell won with a time of 3 hours, 46 minutes and 43 seconds, 47 seconds ahead of the second placed Tim Van Berkel. He explained that he came into the race in solid form, but said that the Shepparton race was an entirely different beast to conquer. 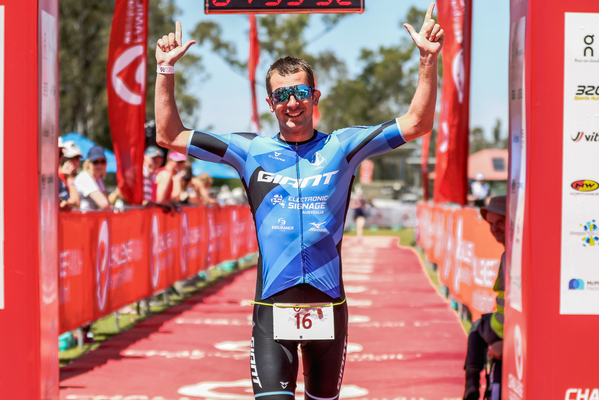 “I’ve had quite a few really good results lately – two or three weeks before Shepparton, I had the Australian Duathlon Championships, and won that,” he said. “It’s normally a pretty competitive field, usually with the best athletes in Australasia. “I kind of entered the race last minute, it wasn’t really on my radar, I was kind of just getting back into it – I was doing just some speed work, not really the long stuff, but it was too good of an opportunity to pass up. Maxwell didn’t have it his own way, and had to claw back to take the lead during his run, storming home despite the fatigue that set in on the final lap. “I had a reasonably good swim, about a minute behind the lead, and I just rode hard and got back up,” he said. “It became a bit cat and mouse; people were playing games, and trying to break away or whatever, and you had to decide whether it was worth going with them and spending that little bit of energy. “Towards the end of the second lap a few guys were in pain a bit and sort of dropped off, and Luke Bell got off the front and Tim Berkel decided to go for it. I knew he was a good runner, so I decided I’d stay with him so I did. “We ended up overtaking Bell, and it was Berkel out front and myself in second – he was probably 10 seconds ahead of me, and got him about 2kms into the run. He just kept looking at his watch and showing signs that he was hurting a little, so I decided to keep going and build a gap. “I pretty much built maybe a 90 second lead, but in the last lap, it was the end of the race, and I was hurting a fair bit – he was making some gains, probably not enough to put me in trouble, but enough for me to go ‘ok, I need to be switched on, and do enough to hold him off’. Maxwell said it gives him belief going forward, and hopes it can be the perfect catalyst for a perfect summer season. “It was my first big series pro win, Challenge is one of the top series in the world, and so to have the win on Remembrance Day in Shepparton against some of the best athletes in the world was awesome,” he said.